I drink sample a lot of whiskey and enjoy every last drop. In all of those samplings there are aromas, flavors and general experiences that run throughout. Vanilla, caramel, spices, oak, whiskeyness if you will. So, when a new whiskey comes through my door I expect those basics in varying quantities and qualities. Whipnose Whiskey from Seven Stills of San Francisco turned that whole expectation on its head. The description of how this whiskey was created is best left to the Seven Stills distillers. Whipnose is the first in Seven Stills’ Collaboration Series. For this project we partnered with Pacific Brewing Laboratory, located in San Francisco. We started by distilling each of Pac Brew Lab’s beers to see if we could make a unique whiskey, and as soon as we tasted the whiskey made from their double IPA we were blown away. Shortly after we brewed 60 barrels of Whipnose IPA, and distilled it into 165 gallons of whiskey, and aged it in new American Oak Barrels. The name “Whipnose” aptly describes the whip of hop aroma this whiskey opens up with. The taste is rich malt, dark dried fruits (plums, prunes), light vanilla, toasted oak, and finishes with a smooth, lingering maple syrup. That whip of hop aroma they mention is absolutely true. It blew me away as well. I would never have expected the hop aroma and flavor to carry through to the whiskey so directly, but it’s there with conviction. The aroma hits you first with hops – citrusy, floral, exactly what you’d expect. Then you get classic whiskey aromas of vanilla, caramel and notes of dried fruits in the background. The flavor is unlike any whiskey I’ve tasted. In my notes I wrote “quizzical look” and if you picture a dog turning it’s head to the side, you’ll know exactly what I looked like. There is fruitiness like crazy in Whipnose, both citrus notes from the hops and dried fruits (cherry, prune). You get the standard whiskeyness of vanilla, caramel and oak as well, but the fruit is the star. The floral aspect of the hops is there as well, but more of a background player. Finally, the finish is light and slightly sweet with a very pleasant hint of bitterness from the hops. This is a whiskey I would slow sip and enjoy the complexity as it warms in your hand. But my brain wouldn’t let it go at that, I had to try it in a Boulevardier. I went with 2:1:1; Whipnose, Sweet Vermouth and Campari and it was a stroke of genius. The resulting cocktail retained the floral aroma of the hops and the citrus and bitter qualities of the Campari teamed up with the same in the Whipnose. The complex herbal qualities of the vermouth round it all out. If it’s possible to mourn the passing of a cocktail, I certainly did when my glass went dry on this one. On the very large plus side, a second release is in the works. Hopefully soon! This comic is far too appropriate not to share. 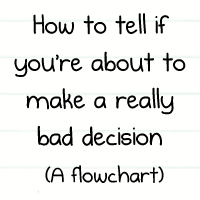 Remember to make good decisions. I think we can all agree that whiskey is definitely an acquired taste. For some of us, myself near the head of the line, that acquisition process is very quick and soon turns into a full blown love affair. For others, they never get it. I’d dare say, some folks are likely baffled by why people drink whiskey at all. Carin Luna-Ostaseski, founder of SIA Scotch Whisky was firmly in the “I’m not sure I get this” camp when she first sampled Scotch with friends. Thankfully she had a determined friend who quizzed her on her favorite cocktails, wines and foods. Armed with this new knowledge, he was able to guide Carin to whiskies that she truly enjoyed. This realization that whiskey has many facets, began her journey to bring to market a new Scotch whisky tuned for the palate of her target audience, whisky virgins and enthusiasts alike with a modern palate. Finally, to bring her dream to reality, she appealed to the masses on Kickstarter and their funding told her she was on the right track. And now it’s here. SIA Scotch Whisky (from the Scotch Gaelic word six) shows itself as a light honey/amber color. The aroma is awash with hints of dried fruit, fruitcake and sherry with herbal/medicinal notes floating in the background. The flavor brings a subtle sweetness of caramel, vanilla and a hint of fruit. There is a bare hint of smoke and medicinal peat that lets you know you’re drinking a Scotch whisky. The finish is long and light with hints of toasted cereal grains and honey. This is definitely a lighter whisky and I can certainly see where it would appeal to whisky virgins. SIA doesn’t punch you with peat, smoke or aggressive flavors. But, I can see the appeal for whisky enthusiasts as well. You get nuances of a lot of Scotch whisky regions but the whole remains harmonious. I can definitely see myself reaching for a dram of SIA when I’m looking for something lighter that still brings an interesting flavor spectrum.